BCDB Rating: 3.9/5 Stars from 14 users. This page has been viewed 76 times this month, and 7467 times total. Don Bluth Ireland, Premier Films Ltd. Cartoon Characters: Hubie, Chubby, Gentoo, Marina, Priscilla, Chinstrap, Pola, Chinstrup, Gwynne, Chinstrap, Timmy, Petra, Beany, Drake, Scrawny, King, Megellenic, Royal, Tika, McCallister, Rocko. Produced By Russell Boland, James Butterworth. Animated By Frank Molieri, John Pomeroy, Len Simon, Richard Brazley, Silvia Hoefnagels, Ralf Palmer, John Hill, John Power. Written By Rachel Koretsky, Steven Whitestone. Music: Mark Watters, Barry Manilow, Bruce Sussman. Editor: Thomas Moss, Fiona Trayler. Originally Released on April 11, 1995. You can watch this cartoon today on your computer. 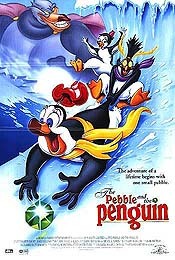 Just click below to start viewing "The Pebble And The Penguin" online now. Do you have anything to add to this page? 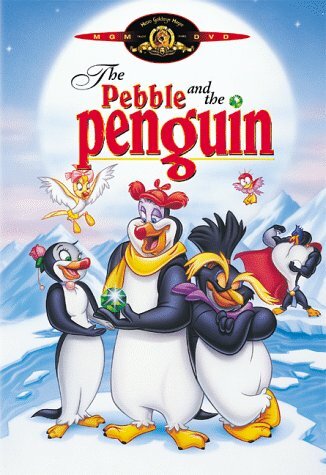 Have we made any mistakes... or do you have any additional information about The Pebble And The Penguin? If so, we would love to hear from you. Please send us a quick note with your additions or corrections to this page, and we will make the corrections as soon as possible! Below are comments about this cartoon submitted by people who have seen this show. Take a look and see what others have said about The Pebble And The Penguin. We want to know what you think, too!! Feel free to share your own opinion- we do want to hear from you! You can add your own comments here. This is an excellent film because it is hand-drawn, hand-painted, and the story concept is absolutely perfect. It actually is accurate with regard to penguin biology, too. Perplexing about all the low ratings. This is a kids film as well as an adult film. My kids were transfixed during the whole show when I played the DVD for the first time (now they want to see it over and over). This is a TRULY AMAZING film for anyone of any age wanting to laugh, shed a few tears, and end up smiling by the end credits. It's another animated magical musical tale from the creator that gave us "THE SECRET of N-I-M-H!" That Kids of all ages will love --It will bring the kid out in you! A great concept, with very good music, that was sabataged by a very weak story. The talents of Don Bluth were wasted on this one. The Pebble And The Penguin by Big Cartoon DataBase is licensed under a Creative Commons Attribution-NonCommercial-ShareAlike 4.0 International License.